It's EASY! Submit your billing records to us on a predetermined schedule and we handle the rest of the claims management. We can even help customize your office paperwork flow. Our staff of experienced professionals will consult with you organizing and reporting your healthcare documentation. We will make the transition smooth and easy, allowing you and your staff to concentrate on your priorities. We handle the headache of claims processing. Many steps are required on route to the payment source. 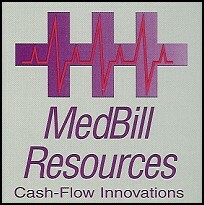 At MedBill, we have the experience, knowledge and trained staff to pursue complex billing procedures. We are familiar with the maze of multiple payment sources which includes all types of private insurance companies; workers compensation claims and all of the federal requirements necessary to bill all appropriately. Our state-of-the-art electronic claims-filing system dramatically reduces the turnaround time for claims payment. Call or E-Mail today for more information or a FREE CONSULTATION and Review. With MedBill Resources, collections can be directly deposited into your account.